Having a house with trees around it would give it a cozier feel not just outdoors but also in the internal area. That is why homes would always be surrounded by trees and plants and would even carry nature’s look into the house by using wood and Earth tones. 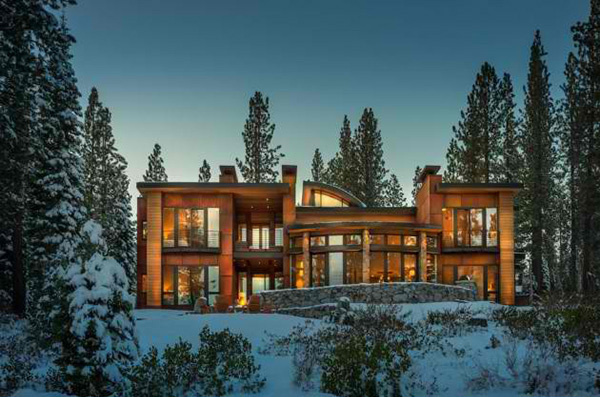 Our house feature for today is located near Lake Tahoe, California with amazing views from nature. Aside from that, it also adapted its colors from nature which we can see not just in its exterior but also in the interior. 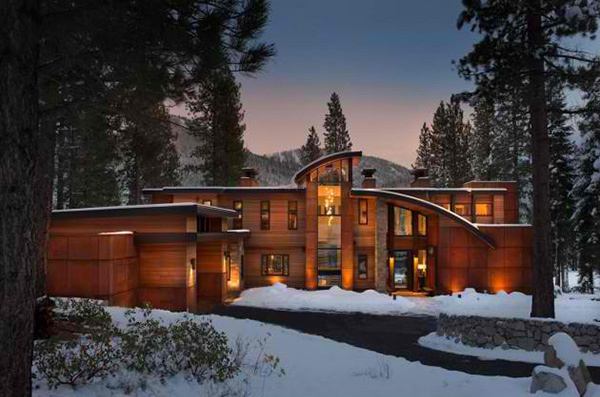 The house is called Martis Camp House designed by Swaback Partners. 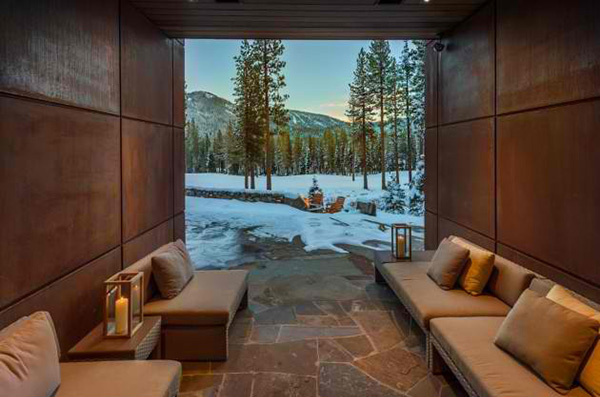 It is said that the home’s concept is to “celebrate the light and airy feeling of snow and the effects that it can bring to the interiors.” And we can see just that in the images that we will show you below. The location and exterior of the house would remind us of movies like Twilight where the house is at the heart of the forest. 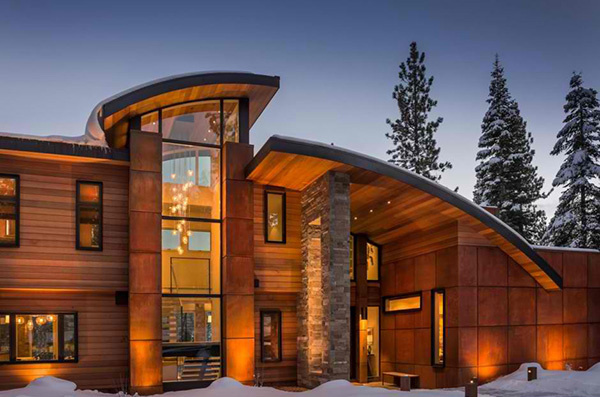 The wooden exterior of the house make it appear like part of nature but what makes it appear beautiful is its combination of curves and straight lines. A closer look at the house shows us that it used wood and stones for the exterior. The tall glass wall will surely allow illumination in the home’s interior. The interior also have stones in the interior and uses Earth tones in it. We’d guess this is the foyer since the chairs are placed near the walls to allow passage. 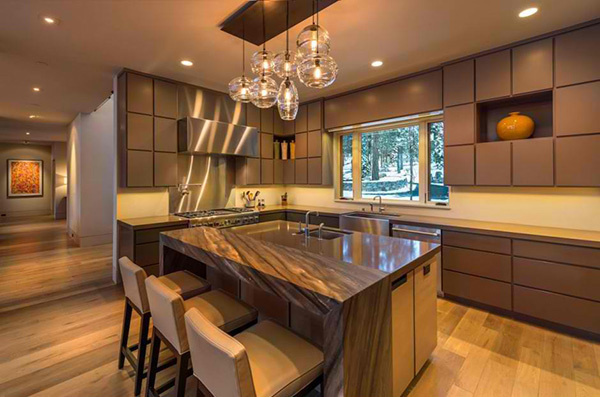 The kitchen looks glamorous in this color especially with the glossy kitchen island top and the glass counter lightings. 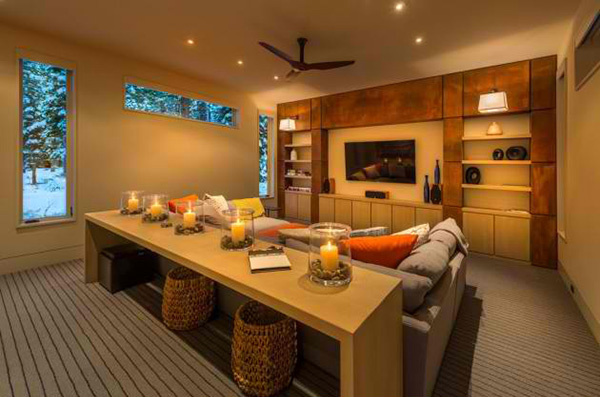 This family room has a long table and some ottomans for alternate seating. We like the colors of the wall shelves! 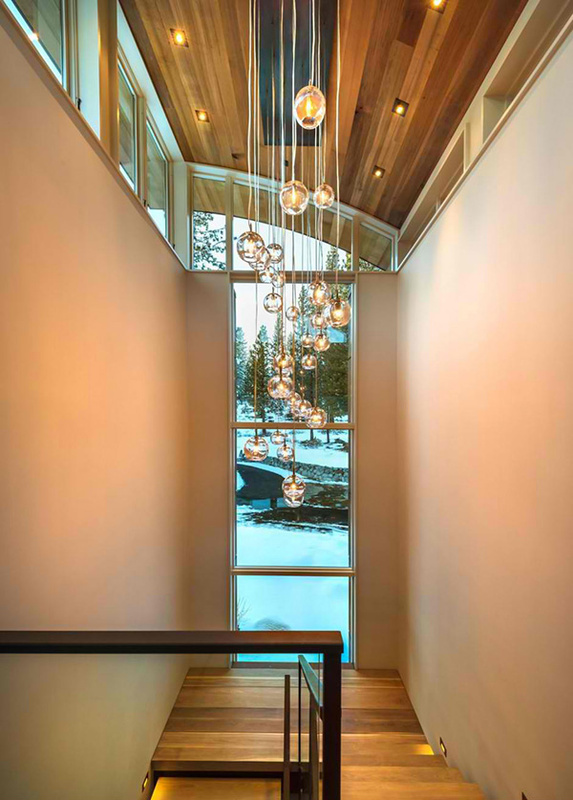 Clear glass balls for this chandelier looks perfect for the space as it catch the light from the tall glass window. One bedroom in the house with a clerestory window and sliding door that leads to the outdoor space. The modern fireplace adds some warmth in the space. 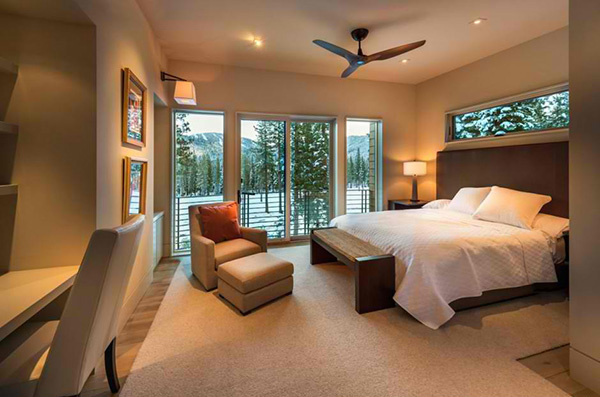 This bedroom has the same color palette with the previous one but it has lesser furniture in it and it doesn’t have a fireplace. 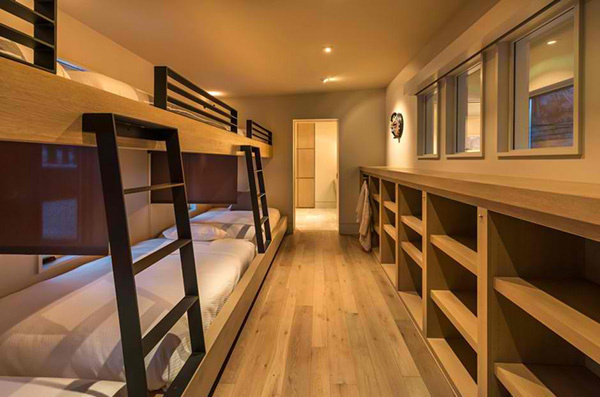 Aside from the two bedrooms above, there is another room with double decks and would allow more people to sleep in it. 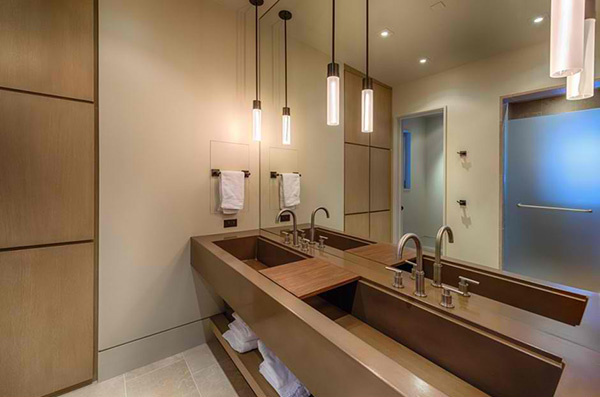 The lights in the bathroom is beautiful and its color would make one feel even more comfortable. The vanity has wood materials in it extending the organic feel of the house. 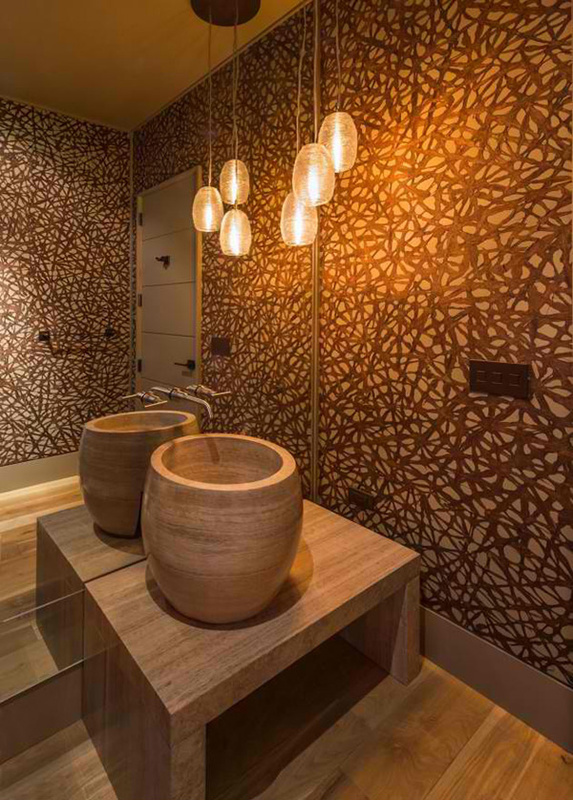 We think this is a powder room with wooden vanity and lavatory as it sits with an artistic wall around it. Well, no doubt about it, Swaback Partners did a great job for this house design! Just look at how strong the exterior appears without looking traditional. It actually looks contemporary and suits perfectly to the environment. The interior is a cozy space that would seemingly embrace those who are inside with its warm aura. What can you say about this house?